We all want to reduce our heating bills and make our homes more energy efficient. 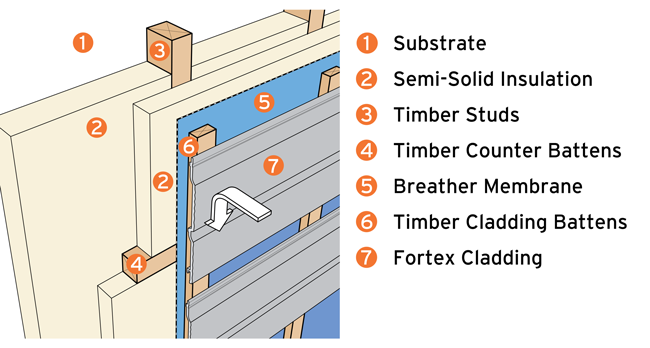 Fitting exterior wall cladding can provide the ideal solution to insulate your home. Designed for use on all types of materials including brick, block, masonry and concrete, when fitted with standard insulation materials the BRE (British Research Institute) Green Guide gives PVC cladding an A+ rating. This means that choosing cladding not only improves the appearance of your property but gives you extra insulation and the chance to save money. Solid walls allow twice as much heat to enter your home compared to cavity walls. See the handy chart below to see how much you could save. *Figures from Energy Saving Trust. Estimates based on insulating a gas-heated home. Costs may vary significantly depending on level of work required. Above estimates are based on a typical install, ranging between a small flat and a large detached home. External wall insulation involves fixing a layer of insulation material to the wall, then covering it with a cladding. In some instances you may need planning permission - check with your local council. You will require good access to the outer walls and it is not recommended if the outer walls are structurally unsound and cannot be repaired. PVC Cladding is A+ rated.